If you're lucky enough to be in Italy for Easter, you probably won't see the Easter bunny or go on an Easter egg hunt but Easter in Italy is a huge holiday, second only to Christmas in its importance for Italians. While the days leading up to Easter in Italy include solemn processions and masses, Pasqua, as it's called in Italian, is a joyous celebration marked with rituals and traditions. Pasquetta, the Monday after Easter Sunday, is also a public holiday though-out Italy whilst strangely, Good Friday or Venerdì Santo, is not. 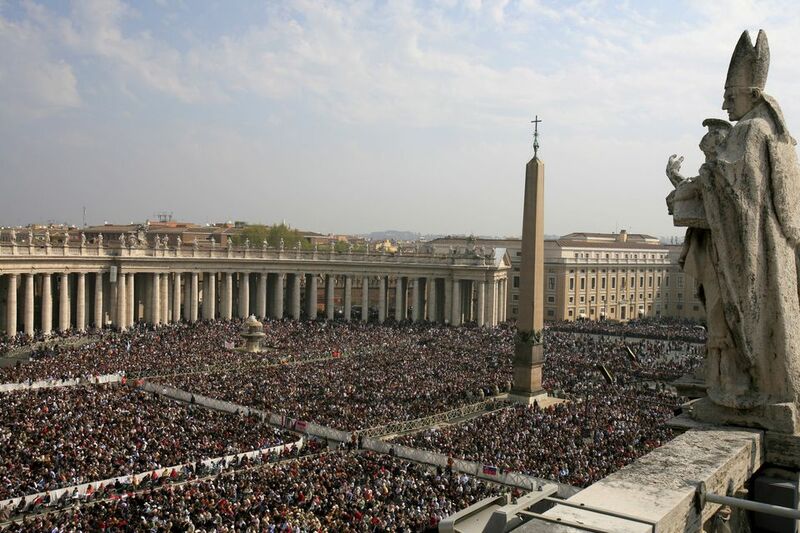 On Good Friday the Pope celebrates the Via Crucis or Stations of the Cross in Rome near the Colosseum. A huge cross with burning torches lights the sky as the stations of the cross are described in several languages. At the end, the Pope gives a blessing. Easter mass is held in every church in Italy, with the biggest and most popular celebrated by the Pope at Saint Peter’s. Solemn religious processions are held in Italian cities and towns on the Friday or Saturday before Easter and sometimes on Easter Sunday. Many churches have special statues of the Virgin Mary and Jesus that may be paraded through the city or displayed in the main square. Parade participants are often dressed in traditional ancient costumes, and olive branches are often used along with palm fronds in the processions and to decorate churches. Enna, in Sicily, has a large procession on Good Friday, with more than 2,000 friars dressed in ancient costumes walking through the streets of the city. Trapani, also in Sicily, is a good place to see processions, held several days during Holy Week. Their Good Friday procession, Misteri di Trapani, is 24 hours long. These processions are very elaborate and quite dramatic. What's believed to be the oldest Good Friday procession in Italy is in Chieti in the Abruzzo region. The procession, with Secchi's Miserere played by 100 violins, is very moving. Some towns, such as Montefalco and Gualdo Tadino in Umbria, hold live passion plays during the night of Good Friday. Others put on plays enacting the stations of the Cross, or Via Crucis. Beautiful torchlight processions are held in Umbria in hill towns such as Orvieto and Assisi. 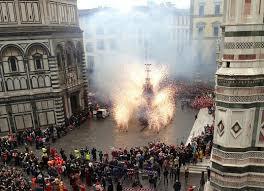 In Florence, Easter is celebrated with the Scoppio del Carro (the explosion of the cart). A huge, decorated wagon is dragged through Florence by white oxen until it reaches the Basilica di Santa Maria del Fiore in Florence's historic centre. After mass, the Archbishop sends a dove-shaped rocket into the fireworks-filled cart, creating a spectacular display. A parade of performers in medieval costumes follows. 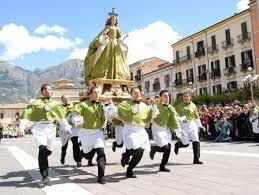 Sulmona, in the Abruzzo region celebrates Easter Sunday with La Madonna Che Scappa in Piazza. The island of Sardinia is a part of Italy steeped in tradition and a good place to experience festivals and holidays. Because of its long association with Spain, some Easter traditions are strongly linked to the Spanish Semana Santa or holy week. Since Easter is the end of the Lenten season, which requires sacrifice and reserve, food plays a big part in the celebrations. Traditional Easter foods across Italy may include lamb or goat, artichokes and special Easter breads that vary from region to region. The Colomba (a dove shaped cake) is often given as a gift as are the more recognisable chocolate eggs that usually come with a surprise inside. 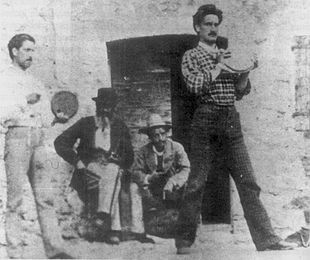 On Easter Monday, some cities hold dances, free concerts, or unusual games, often involving eggs. In the Umbrian hill town of Panicale and many other rural areas a game called ‘Ruzzolone’ is played and involves rolling wheels of cheese, weighing about 4 kilos, around the village walls and along village roads. It’s a bit like a cross between a huge cheesy yoyo and an old fashioned stick and hoop and the object is to get your cheese around the course using the fewest number of strokes.